Today we’re excited to announce the release of a major software update. This new version is based on thorough analytics and the response from our initial users. v1.5 includes several small bug fixes and three major optimizations of the user interface. With the first user interface adjustment, it is now possible to better monitor progression in enrolled courses – both as a teacher, and as a student. In the training calendar, the start and end-date of courses will be displayed, and as for now, students can get an overview of both course requirements and a percentage of the completion. Likewise, is it possible for teachers to access course information and trace the student completion percentages as well as go through each students’ outputs from playing the games. The biggest change of v1.5, is that users no longer get points from playing the games; now the actual training time is the point of measurement. This is done to reduce the apprehension of performance. Training creative qualities will actually make a person more creative, so the overall goal is merely to spend time training. Research has shown, that playing 10-15 minute daily will actually have an effect on creativity. Thus, it is made easier to follow the time you have actually spent on your creativity training. Finally, it is now easier for the user to track their progression in each game as the level of difficulty is shown in the upper left corner. The level of difficulty is incorporated as a small medal, climbing in the sequence of bronze, silver, and gold. The medals will highlight once when reaching a new level, and the amount of levels played in each game is also visible. Hint: you can still follow the game progression in the bar underneath each game on the ‘Home’ page. However, our work isn’t done yet; we’ll be releasing updates, as well as developing additional features to improve the game experience. 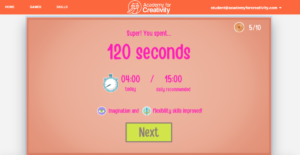 You can play at www.academyforcreativity.com.